Caster Semenya, the South African runner at the centre of a gender dispute, has been placed on suicide watch, according to a report in the Star newspaper in South Africa. The report, published last week, said Semenya is being cared for "round the clock" by psychologists after unconfirmed reports that the 18-year-old is a hermaphrodite. "She is like a raped person. She is afraid of herself and does not want anyone near her," Butana Komphela, chairman of South Africa's sports committee, told the paper. "If she commits suicide, it will be on all our heads. The best we can do is protect her and look out for her during this trying time." South African athletics officials said Semenya is receiving trauma counselling at the University of Pretoria. On Thursday, Athletics South Africa called for a commission of inquiry into its handling of Semenya's case. The national governing body has been criticized for failing to protect Semenya. 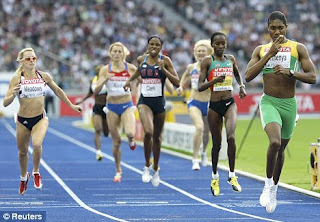 Whether officials from ASA were involved in gender tests done on her in South Africa is not known. The ASA, which will appear before parliament next week to explain its role in the case, said an investigation would ensure the organization operated in the "best interests of all its athletes." Semenya was thrust into the spotlight after she won the women's 800 metres at the world championships in early August amid reports that the International Association of Athletics had conducted complicated gender testing on the runner in July. The IAAF hasn't disclosed the results of the tests, but several media outlets reported Sept. 10 she was found to be a hermaphrodite, with both male and female sexual characteristics. On Tuesday, the world's governing body for athletics was slammed by Noluthando Mayende-Sibiya, South Africa's minister for women and children, for how it handled the case. She said the IAAF showed "blatant disregard" for Semenya's "human dignity" and has filed a complaint with the United Nations.